8 oz butter That’s two sticks; and it’s gotta be room temperature. In a stand mixer, cream together butter and sugar at medium speed for three minutes, stopping to scrape the bowl as necessary. Add salt and cinnamon; then crank the mixer back to medium and add eggs one at a time as each integrates into the mix. Continue to beat on medium for another 2 minutes, scraping the bowl as necessary. Set the mixer to stir and spoon in the flour. The fiished batter should have the consistency of a sticky cookie dough. Fire up your waffle iron to 400F (around medium-high) and dish out measured tablespoon-sized portions (3/4 oz) into each division of the waffle iron. “Bake” for 2 minutes or until golden brown, and let cool and crisp up on a wire rack. 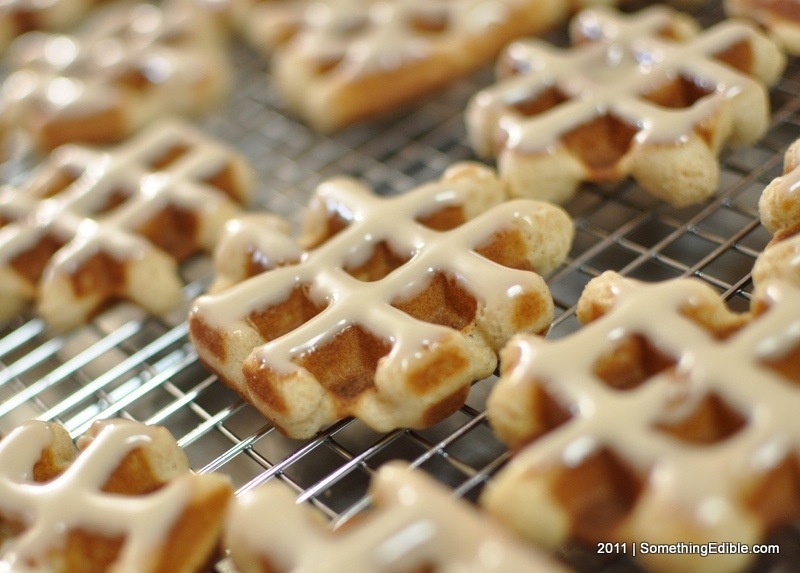 For the glaze, whisk together the powdered sugar, maple syrup, and salt until integrated and smooth. Dip the tops of each cookie in the glaze and return to the rack to let the glaze set. Cook time assumes you’re working in batches of 4 – 36 cookies / sets of 4 * 2 minutes a batch. While visiting Eureka, CA, and the Redwoods, we stopped in the tiny town of Loleta, and found the lovely little Loleta Bakery (http://www.loletabakery.com/) for lunch. We enjoyed half sandwich combos, egg salad and roast beef, the first with great perfect local greens, and the second with a cup of tomato chicken soup. A pot of organic Humboldt Herbals plum oolong tea was a delicious beverage. We couldn’t resist a couple of “little” (JK) desserts. The Texas Pecan Pie bar was incredible. I practically begged the very nice owner, Jeannie, for the recipe. 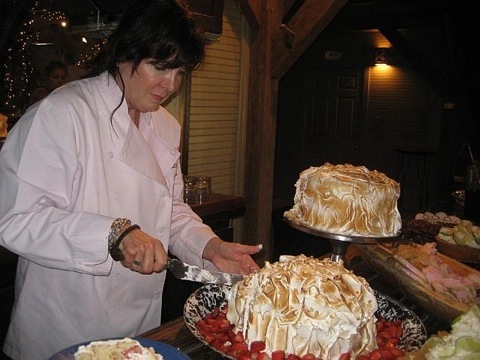 The original is from a cookbook called “The Pastry Queen” (Rebecca Rather, shown in picture below). Jeannie makes it slightly differently, with a thin caramely crust bottom AND top. The squares are so big, she cuts the serving into 4 smaller squares, and adds a dollop of whipped cream. I will post the recipe when I get home, but you can find it online if you can’t wait. 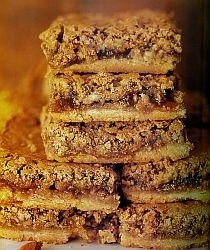 Can’t wait to make these at home!